Being flexible with your plans is incredibly important. Had I not checked that the skies were going to be clear with cloud building from the west, it would have been all to easy to look for a North East facing winter sunrise to be confronted with a bland sky and a fireball. Realising this meant that I reversed my viewpoint to use the mountains and sparse westerly clouds to become the backdrop and as luck would have it the sky turned rose red over the tiny castle which duly reflected down on the snow covered mountain peaks. 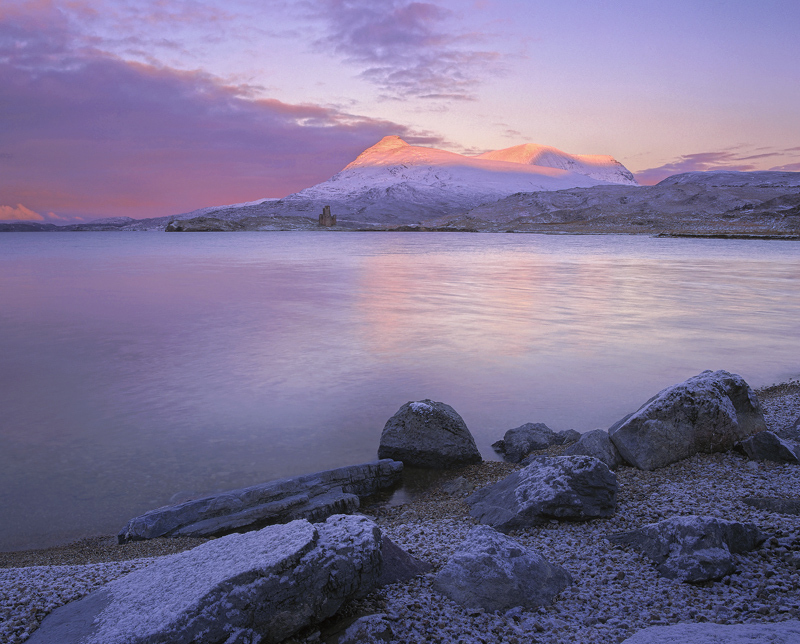 I waited for first light to turn the tops strawberry red and used a long exposure to smooth out the water to realise a vague reflection of the sunlit summit of the Quinag.